Retinopathy is a degenerative disease of the retina, the part of the eye that senses light and send images to your brain. In Diabetic Retinopathy, the prolonged, excessive amounts of glucose (sugar) in the bloodstream weakens and damages the retina. The weakening causes the vessels to leak, aneurysms, scarring, and sometimes retinal detachment. Across the globe, it is estimated that about one-third of the estimated 280 million diabetics have this disease. Thousands are diagnosed with diabetic retinopathy each year. Diabetic retinopathy affects men and women with a slightly higher prevalence in men. It is a leading cause of blindness in adults under the age of 75. 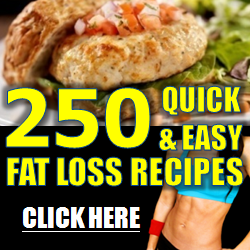 It is estimated that by the year 2030 approximately 11 million people will have the disease. This number is projected to increase to 30 million by 2050 as the incidence of diabetes increases. Early diabetes diagnosis, treatment, and strict monitoring are paramount to the prevention of diabetic retinopathy. For those with a diagnosis of diabetes, with or without retinopathy, more frequent eye exams are necessary to catch any problems early. Something as seemingly innocuous as blurred vision can, in fact, be a leakage of blood or fluid from the retina. DPDR (non-proliferative diabetic retinopathy) is an early-stage retinopathy. In this stage, there may be no symptoms. The retina and blood vessels are weakened. It is the most common stage of retinopathy. PDR (proliferative diabetic retinopathy) is an advanced retinopathy. “Circulation problems deprive the retina of oxygen”. In the body’s effort to fix the problem, the eye forms new, weaker vessels that can leak and cause vision to be cloudy or blurry. If the new vessels grow into the area that drains fluid from the eye, glaucoma and optic nerve damage can occur. Left untreated, this can lead to blindness. Since blurry vision can be a symptom of either type of retinopathy, it is important to have regular, frequent eye examinations. Add to this the fact that, for some, there are no symptoms until the retinopathy is advanced. The risk factors for diabetic retinopathy can be categorized by the things that can be controlled, and the things beyond your control. 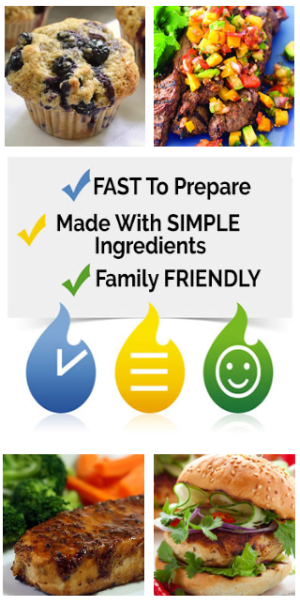 It is important to remember, especially in those diagnosed with diabetes, that early on there may be no symptoms. Treatment of diabetic retinopathy depends greatly on the type of retinopathy and the amount of damage already done. The goal of treatment is to slow or stop the progression of the disease. The primary treatment of diabetic retinopathy is to treat the cause…AKA diabetes management. Depending on the extent of the damage, laser surgery may be an option to seal the leaky vessels in the eye. Laser surgery can also be used to prevent other weak vessels in the eye from leaking. Medication can be injected into the eye as a treatment. Also, the vitreous (gel-like fluid in the eye) may be replaced. Lastly, surgical repair may be necessary in cases of retinal detachment. Unfortunately, no treatment can restore what vision has already been lost. 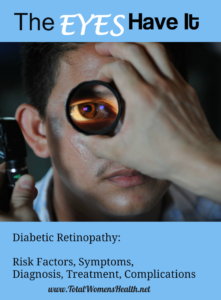 Diagnosing diabetic retinopathy may include a physical exam, visual testing (for acuity and refraction), dilation of the pupil (so that other eye structures can be seen), and measuring of the pressure within the eyes (to check for glaucoma). 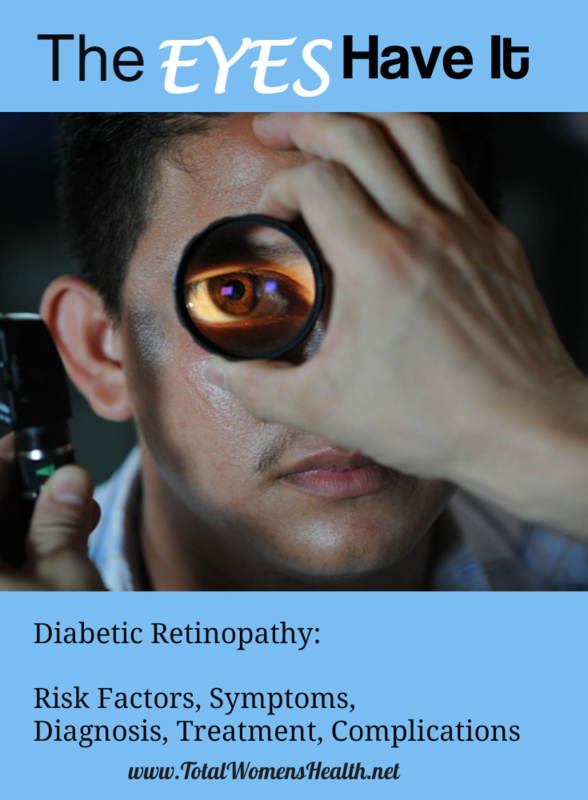 The associated complications of diabetic retinopathy include a higher risk of developing blindness, cataracts, cardiovascular disease, neuropathy, as well as an increased risk for coronary heart disease and stroke. Prevention is the key to keeping your vision for those with diabetes. It is important to keep diabetes under control by making the necessary lifestyle changes and controlling what you can, like: diet, exercise, blood pressure control, cholesterol control and proper check-ups for early detection of visual problems. Even if you do everything right, you can still develop diabetic retinopathy, but proper preventative measures help to slow the progression of the disease. So, monitor your blood sugar, take your medications as prescribed, stick to the prescribed diet, exercise as directed by your doctor, monitor and control your blood pressure, and stop smoking. The more controlled your diabetes, the less likely you are to develop diabetic complications.